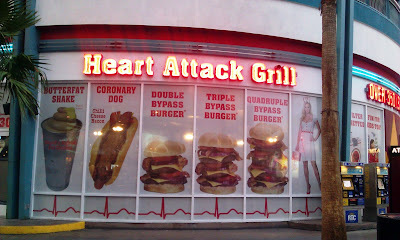 Our 4th burger to try on this trip to Las Vegas was the recently relocated Heart Attack Grill. Heart Attack Grill, located in Old Las Vegas (Freemont Street), was originally a Chandler, AZ establishment, and it had been uprooted to find a new home in NV. Parking was available at a nearby public lot, and a quick walk through a less glamorous (sanitary) part of Las Vegas got us to the front door. At the front door there was a massive scale for incoming patrons to step on in the event that they wished to show the outside crowd how much they weighed. A similar scale was available inside. 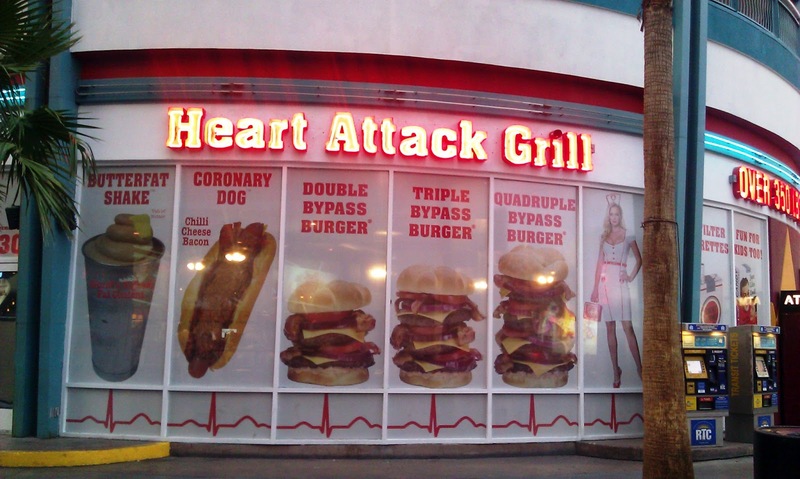 Heart Attack Grill offered free meals to patrons over 350 pounds. Happy Meal and I watched in stunned amazement when a massive human weighed in at 402 pounds. A siren went off, and the place burst into applause. It was like the Biggest Loser in reverse. Beyond that, patrons that failed to clean their plates were paddled (hard) by the staff. The staff was women in tight nurse uniforms. The customers were dressed in hospital gowns upon entering the establishment. There was even a blood pressure machine with a Hall of Fame list of the highest recorded systolic and diastolic pressures. I ran mine for kicks. My heart rate was 53, and the machine could not register my BP (it's usually 100/60). The machine displayed an error message--I think I broke it! Happy Meal and I, being little fellas, ordered a couple of Single Bypass Burgers, fries, and water. Each patty at Heart Attack Grill weighed in at 8 ounces, so the Quadruple Bypass Burger would have been 2 pounds of meat. The fries were cooked in lard, so we went with a single order. We passed on soft drinks, since the only sodas that were offered were of the full-sugar variety. 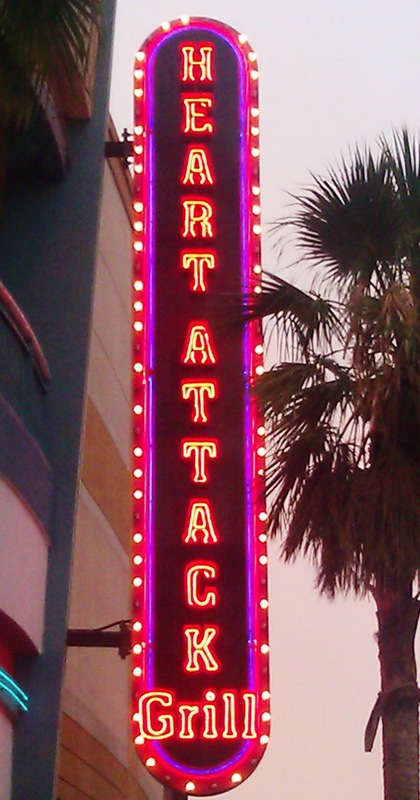 Oh, Heart Attack Grill was cash-only, and there was a low-fee ATM on-site. The Beef: Heart Attack Grill took delivery of their pre-ground Chuck from Larry's Great Western Meats. The Chuck was strongly beefy. It was neither juicy nor dry. The fat content was 20%. The cheeseburger had a nice flavor of funk from a little aging. The 8-ounce patty was hand-formed, irregular, and about a 1/2 inch in thickness. The beef was firm without being chewy. The beef was coarsely ground to deliver a hearty mouth feel. The beef was above average. The Seasoning: There was none. This was forgivable in the case of Heart Attack Grill. They typically only served their burgers with tomato, onion, cheese, and chili. They were kind enough to indulge us with an exception to this rule. The chili was flavorful enough to compensate for the lack of salt and pepper on the cheeseburger. The Sear: The sear on the burger patties was average. Heart Attack Grill used a gas-fired, roller grill--a tunnel of love for ground beef. This imparted a moderate but not crisp sear. The Preparation: There wasn't much to it. The patties were cooked automatically. They arrive a perfect Well-Done, and for that I was grateful. I wanted as much of the fat to render off as possible. The Cheese: The thick slices of American cheese was perfectly melted over the burger patty. The cheese provided a creamy, gooey texture. It also delivered iron and salt to the bite. The Bun: This was a potato bun from Great Buns Bakery of Las Vegas, NV. The bun was on the dry side, and it was barely toasted. Again, the fully dressed burger would have compensated for this. The bun was very mild. It was really just a way to deliver calories. The Meat To Bun Ratio: This was perfect. I imagined that the bun may have been a little challenged has I tried to eat the fully dressed burger. The Fries: The lard cooked fries were strongly reminiscent of Five Guys. The fries were cut in house. The fries were par-cooked and peel-on. The fries were a little lank, but they were properly seasoned. 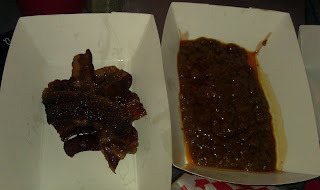 The Toppings: The Heart Attack Grill chili was creamy, savory, and laden with orange grease. It was delicious. The tomato slice was fresh and ripe. The bacon was crisp and salty. The Value: $8.33 for a 1/2-pound cheeseburger with chili was a fine price. Happy Meal and I were barely able to finish our meals. Frankly, the prospect of a paddling spurred us both to polish off the largish burgers. The food value at Heart Attack Grill was solid. The entertainment value was huge. Heart Attack Grill was a tongue-in-cheek celebration of culinary excess. Desserts included candy cigarettes and butterfat milkshakes. They also held the record for the most caloric burger. This from Wikipedia: The Quadruple Bypass Burger with 9,982 calories has been identified as one of the "world's worst junk foods." It consisted of four half-pound beef patties, twenty strips of bacon, eight slices of American cheese, a whole tomato, and half an onion served in a bun coated with lard." I put in a 200-story stairs climbing workout the following morning to bun the excess calories that I had consumed. 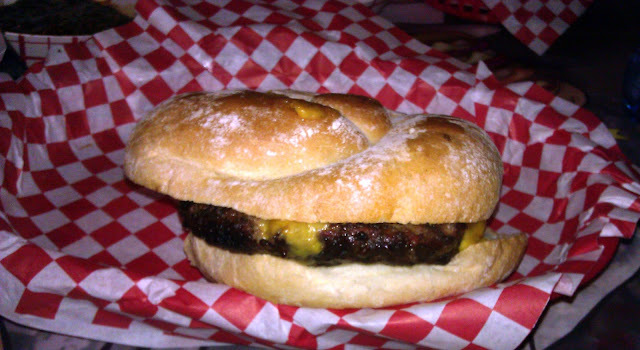 Burger Review : Schtick aside, Heart Attack Grill served up a pretty good burger for a pretty good price. I would go again. The worst food and most horrible people in Las Vegas. I wish I could give it a negative star. I ordered water, hot dog and a chocolate milk shake. The water was cold. But the shake tasted like any cheapo fake shake. The hot dog tasted sour and the chili smelled and tasted vaguely like vomit. The bun was stale and hard. I could not swallow the bite I took. We asked for the check and I told our server that I would pay for the water and the shake (I ate 2 or 3 bites). However I hadn't been able to eat the hot dog so I took it off the bill. She said "no, you have to pay". I asked to speak with the manager and this is when I got weird. The manager also demanded I pay. She stood no more than 10 inches from me saying she wasn't going to let me leave. I told her at least 10 times to back up. She yelled across the restaurant for someone to call security. Meanwhile another manager comes to stand very close to me. They were threatening me until I finally put the money down and ran crying from the restaurant. I stopped security and told them what happened. Security told us they held me there illegally and that they wouldn't have made me pay. At that point I thought, ok, I'll get my receipt and write an e-mail. As I entered the restaurant and employee met me at the door, raised her arms and hit me squarely on both shoulders. She said,"You're not coming in here. I stepped back from the impact and yelled I'm a customer and I want my receipt. I grabbed it and ran back to my hotel. DO NOT EAT HERE!